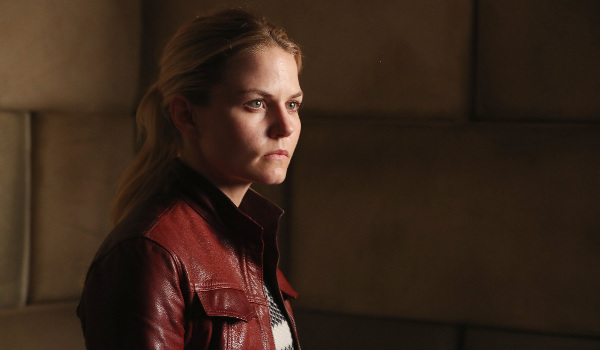 While leaving the return of the Evil Queen (Lana Parrilla) to be explored next week, the season premiere of Once Upon a Time focuses primarily on Emma (Jennifer Morrison) who begins having shakes and visions following the arrival of Hyde (Sam Witwer) and an unknown number of companions from the Land of Untold Stories. Exploring just who and what the Savior is appears to be one of the season's big themes, which begins with a flashback revealing that Emma isn't the first Savior and is followed much later by the revelation of what end fate has in store for Emma courtesy of both Hyde and the Oracle (Jordyn Ashley Olson). As to the identity of the villain destined to take down the Savior, we'll just have to wait and see who it is revealed to be. Other stories from "The Savior" include Rumpelstiltskin (Robert Carlyle) traveling into Belle's (Emilie de Ravin) dreams in an attempt to wake his sleeping wife and friction between Regina (Parrilla) and Zelena (Rebecca Mader) that may lead the Wicked Witch to seeking sisterly companionship from a darker source. Although Rumpelstiltskin isn't successful in his attempt to wake Belle from inside her dreams, she does awake thanks to the intervention of Morpheus (Giles Matthey) who, if he is to be believed, is her unborn child who will one day grown up to be the master of dreams.